Worried about getting a licensed version of Office Suite? Or unable to figure out which MS Office software would fit your requirements? Why bother to get one at all? Consider using Google Docs! Google Docs is a web-based, software as a Service (SaaS) office suit by Google, and the documents are being saved in ‘Google Drive’ as they change in real time. A collaborative tool to create, edit and share documents online by multiple users simultaneously. It has options to create Document, Presentation, Spreadsheet, Form, Drawing. You can also sync the documents to view offline. And changes made to document at one device, get updated everywhere. Share your ideas, suggestions in a single click while collaborating with others by sharing the documents. 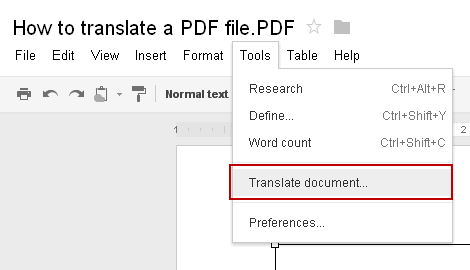 You can translate your documents to 64 other languages. Find the meaning of words with an inbuilt Dictionary. 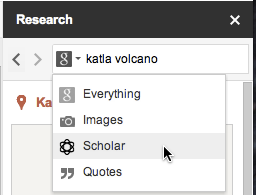 Research topics with customized search option on the document page itself. Insert footnotes at the bottom of the page, cite attribution and references. Now share documents, even folder by adding people’s email id or by sharing link. No need to email attachments anymore and save storage spaces. You can email your collaborators who has access, you can also add new people with view, edit and comment permissions. You can publish the document to the web, there are three visibility options, ‘Public on the web’, ‘Anyone with the link’, and ‘Private’. If you set the visibility option to Private, then only people who are given access can access it. It detects the web link which may available on the web. It substitutes characters to symbols e.g. (c) to © and 1/2 to ½ etc. It counts the pages, words, characters without spaces and with spaces. Spreadsheets which are larger than 20 MB can not be converted to Google spreadsheets. And it must be under 400,000 cells and 256 columns per sheet. And images suppose to add to spreadsheets must be less than 2 MB. To work offline, you will have to be working on Chrome or Chrome OS (Chromebook). Documents which are to be converted to Google documents can not exceed 1 MB. People with only viewing access can not publish the document. It’s not possible to publish PDF Documents. Save to Google Drive. This extension allows to save any content(images,docs,pdf) directly to Google Drive. You can also change the format of the page which you want to save, at options page of the extension. And later at Document list, you can organize and share your documents. Once a Google document is created, it can be downloaded in following formats; Microsoft Word (.docx), OpenDocument Format (.odt), Rich Text Format (.rtf), PDF Document (.pdf), Plain Text (.txt), Web Page (.html). Similarly, a Google spreadsheet once created, can be downloaded in Microsoft Excel (.xlsx), OpenDocument Format (.ods), PDF Document (.pdf), Comma Separated Values (.csv), Plain Text (.txt), Web Page (.html) formats. Also a Google presentation once created, can be downloaded in Microsoft PowerPoint (.pptx), PDF Document (.pdf), Scalable Vector Graphics (.svg), PNG image (.png), JPEG inage (.jpg), Plain Text (.txt) formats. And a Google drawing once created, can be downloaded in PDF Document (.pdf), Scalable Vector Graphics (.svg), PNG image (.png), JPEG inage (.jpg) formats. Other supported file formats for viewing are Apple Pages (.PAGES), Adobe Illustrator (.AI), Adobe Photoshop (.PSD), Tagged Image File Format (.TIFF), Autodesk AutoCard (.DXF), PostScript (.EPS, .PS), Fonts (.TTF, .OTF), XML Paper Specification (.XPS), and Archive File Types (.ZIP, .RAR). Google has ended support for old Microsoft office formats (.doc, .xls, .ppt) from January 31, 2013. So it means after that users can’t export files to old office formats. So what do you think of using “Google Docs”? Those who have not used it yet, we recommend to use it. Let us know which features you think are the best and make Google Docs unique and incredible?